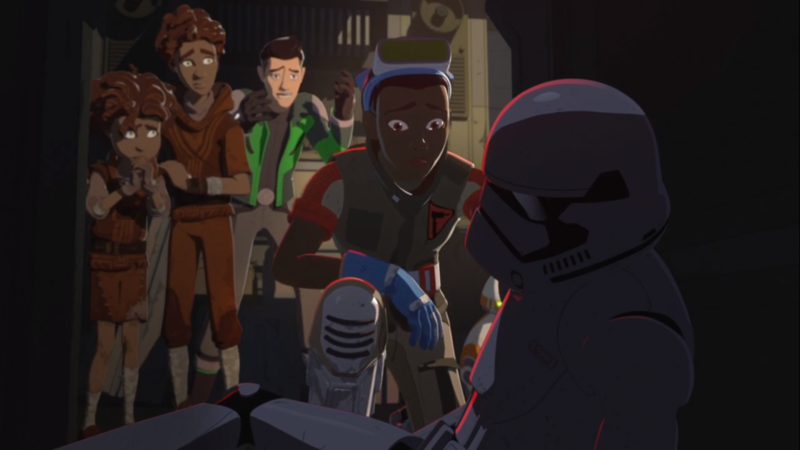 The New Trooper asks “what would happen if you mixed the comedic styling of the show with the heavy implications of what the First Order is and what it really does?”. The episode brings Eila and Kel back into the forefront, as well as getting our main players’ opinions on the First Order further developed in time for the beginning of the end. The plot centers around Kel and Eila knocking out a trooper and having to get Kaz, Neeku, BB8, and Tam to help them cover it up. Kaz’s infiltration with the unconscious trooper’s armor not only gave him a chance to have some great physical comedy, but above all else, let him be in a reverse of his role in the last episode. Here Kaz is having to blend in and show his spy skills completely impromptu; which feels like a natural expansion from“Dangerous Business” testing his resourcefulness, his bravery and growing awareness from “The Doza Dilemma”, and “The First Order Occupation”’s showcase of Kaz’s emotional growth. Despite Kaz’s infiltration having the most screen time - arguably the biggest role this episode wanted to play for the season was establishing Tam’s feelings on the First Order firmly. When we first see Team Fireball they are having dinner with Kaz utterly in disbelief that Tam is ok with the First Order being around, her defense is that they make her feel safe so the freedoms are worth sacrificing. However we see that this point of view goes beyond merely what her personal feelings on the First Order are. Yeager points to the Empire having done the same thing as the First Order: promising security and then eventually enveloping everyone’s freedoms under the guise of protection. Tam brings up that the Empire provided her grandfather with a stable job as a factory worker when he otherwise would not have one, and goes right to “did that make him evil?” defense. Resistance continues to be almost uncomfortably realistic with how it handles authoritarianism. Tam’s defense is the same thing you hear over and over from those who are of a group that was not only not disproportionately disadvantaged by authoritarians and the strengthening of police, but was actively given advantages by them. Talk to those who think that they do not have white privilege or male privilege, or privilege from being hetero; it is always the same claim that their family who were given an advantage were not always directly the ones oppressing and therefore can’t be evil in any way. And by extension they themselves cannot be entitled and privileged since their family faced some hardships too and they personally have not knowingly oppressed anyone. A human in the Galaxy Far Far Away has an inherent advantage due to the two decades of human supremacy brought on by the Empire. It is hard for those of us who are not part of a disparaged group to see that our lives are intrinsically affected by our connection to a group that has strengthened itself by putting down others. So even when someone like Tam knows the Empire is evil, she inherently goes to the defense about her grandfather, and cannot see why people would view the First Order as inherently bad for basing themselves on the Empire. The blame is pushed not onto systemic oppression and power structures, and of course ideology built into the fabric of the galactic community, but rather onto flawed people, and to some extent those who continue to ““hold a grudge””. Yeager’s point about the crew being too young and being born into peace really drives home this fact, even people who are against the First Order have a privilege of being born into peace. Kaz however is against them specifically cause he is someone who can see the past and the actions of the Empire as more than just an ancien regime that they are still directly responsible for the legacy of. There is possibly more going on behind Tam’s denial, when Yeager says that she was not there and just does not understand personally the evil the Empire and its collaborators wrought, her response is that he is siding with Kaz as always. This thread of Tam being frustrated with Kaz screwing up and getting let off the hook has been building since episode 1, and it is intriguing to see her beginning to resent Yeager over it as well now. Though I don’t think this is a major factor in her opinion on the First Order, mainly cause when Kel and Eila tell her that the First Order destroyed their home and killed everyone they know, she is sorry but maintains that there must have been some reason. Even when being dragged into covering up the unconscious Stormtrooper she really wants to keep out of this mess. None of this is to say I dislike Tam, she is honestly my second favorite character on the show, but it does speak to her character flaw being developed, and it is certainly a big flaw given it involves condoning fascism. Kaz’s undercover excursion into the First Order ranks did more than just cover up the missing trooper; it also have us a chance to see more of how the Colossus treats the First Order. Kaz is forced to go along as his squad is told to suppress a riot opposing the occupation. he slips away, but before that happens we get to see an almost entirely alien crowd throwing fruit at the troopers. This just further builds upon the disenfranchisement of the aliens who have deeply-rooted loathing of the First Order and what it stands for. The First Order’s scheming is also moved along this episode, with Kaz having the incoming full FO invasion confirmed for him, as well as acquiring a datarod with what seems to be FO fleet information. Plus we get some mentions of mind erasure and the First Order conditioning in a way that implies it really is more like clones than just social conditioning. It is clear the First Order directly meddles with the brain chemistry of their troopers. One of the great strengths of this piece is how strong the writing is, owing to the talent of Paul Giacoppo’s writing. I already talked about his background and past works in my reviews of his previous episodes “Children of Tehar” and “Bibo”, but specifically here his work on Brave and the Bold clearly shines through with the comedy. Beyond the strength of the writing, however, is the episode’s amazing animation. Steward Lee directing this one should have been no surprise to me, seeing as Kaz’s rubbery movement and fluid motion here is exactly like what Lee did in a previous outing “The High Tower”. The man knows how to direct Kaz doing gymnastics in near death scenarios. The direction finds a great balance between comedy and showing how desolate the station is already becoming. From Opeepit dragging a trashcan around and Kaz’s unintended striking of a nerve over the loss of his sweeper, to the tense situation of our heroes trying to hide an unconscious trooper ; interspersed with them continuously knocking the guy out in progressively more violent ways. This was a fantastic episode, that is risen up mostly due to the fact that just one quick scene managed to give us so much character information so efficiently. My only real complaint would be that we did not see this open opposition to the First Order in the previous episode, so the protest feels a bit like a missed opportunity to have a gradual development of people not being willing to stay silent any longer. Otherwise we could have had a better indication of this growing directly from the quickly expanding FO presence after Synara’s escape. The troopers using stun blasts on civilians by the end feels deserving of a real build up and emphasis is all. To wrap things up I’ll say that the soundtrack for this episode was fantastic. The show has a good theme and is normally well scored, but it has not had many specific tracks that stood out the way Rebels did. This episode however had several musical moments that I absolutely need to hear on their own.